A stone's throw from the village of Castiglion Fiorentino. Old farmhouse of peasant origins, where on the ground floor you can still appreciate the old stables. 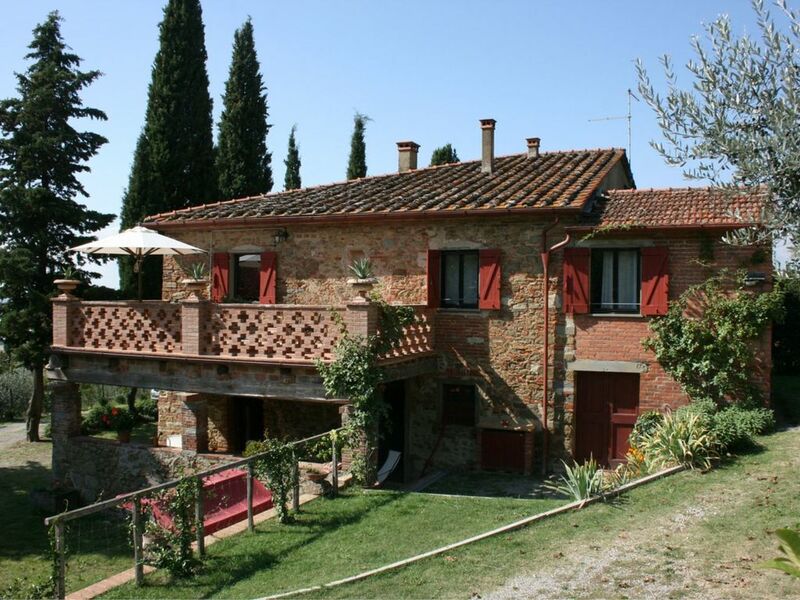 Located 1,5 km away from the town of Castiglion Fiorentino which can also be reached on foot. Castiglion Fiorentino is one of the most renowned towns of Valdichiana and has shops, restaurants and services of all kinds, and offers important cultural and folk events, together with good food and wine throughout the year. Farmhouse of peasant origins traced back to the first years of 1800. The house, that by the structure and the materials used for its construction can be traced back to the first years of 1800, since the beginning of this century has been point of reference to folklore events and in particular the land adjacent to the house was used for target shooting. Targets were aimed from 300 meters, and this gave its characteristic name to the villa. On site there is also a very old, small cellar with a 'volta' which can be dated back to 1600 where, on request, it will be possible to taste certified, organic wine and oil, the very own production of the farm. The infinity-pool, the fenced garden and the tennis court. Around the house a large garden full of centuries-old olive trees about 1 hectare large and completely enclosed with net (1,25 mt high), where we find a beautiful swimming pool (size m. 6 x12- depth 1.40, completely fenced), a small children playground and a well with drinking-water. The villa is pet friendly. Around 800 m. away the guests have at disposal a private tennis court (dim. 18X36 mt.) which is to be shared with the lodgers of VILLA DEGLI OLIVI and COLLINA DEI FIORI. FIRST FLOOR: entrance through external staircase (5 steps) on a small access, two double bedrooms, bathroom with shower, wide and bright living-dining room with fireplace, sofas and large kitchen corner, access to a panoramic balcony equipped with table, benches and sun umbrella for outdoor eating. Double bedroom with fireplace and added single bed, double bedroom with private bathroom with bathtube. GROUND FLOOR: porch equipped with table and chairs, old stables with original manger and stone floors and table and benches to relax in a cool ambient, laundry room. EQUIPMENT: freezer, oven, dishwasher, washing machine, moka coffee maker, filter coffee maker, hairdryer, toaster, ironing set, duster, high chair, ceiling fans, satellite TV, barbecue, wood burning oven, swing, slide, swing seat, Wi-Fi Internet access. We had a lovely week in this property. The accommodation was excellent with 4 good sized double bedrooms. The kitchen was fairly basic but perfect for our needs with 2 fridges which were very useful. The grounds were stunning with the backdrop of a beautiful olive grove and a stunning swimming pool. The views were very impressive. The owners were delightful and we made good use of their excellent tennis court. We had a great holiday and would love to go back. Castiglion Fiorentino is a fabulous place to stay. The villa is kitted out with everything you need and is very well maintained. The house is quite private with beautiful olive groves and a lovely pool. We found the location to be pretty good for visiting a large number of places. Florence, Siena, Assisi and Cortona are all within easy reach. The hosts of this property could not have been better. They were happy to help us with any query or problem we had, frequently brought gifts of fruit from their garden, local cheese etc and were just lovely people in general. Restful holiday with great location. Very welcoming, helpful owners. Hope to visit again. Farmhouse set in stunning location surrounded by olive groves, with views of valley below. Great size pool for adults and children, clean and well maintained. Good sized gardens with numerous areas to relax, eat and socialise. Simple and tasteful interior, plenty of space. Great location for access to larger towns eg. Cortona and Assisi and train station within 5 minute drive with direct line to Florence. Great fun using wood fired pizza oven. Owners friendly and helpful. Car necessary to get to supermarket, restaurants etc. ( 20min walk to centre of town).